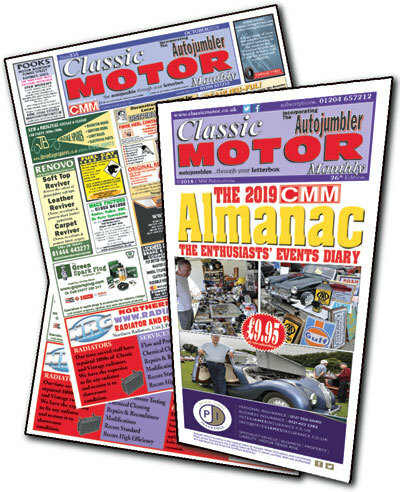 A 12 months subscription to Classic Motor Monthly starts from just £18.50 (UK Sterling) - you get 12 issues mailed direct to your door with all the latest news, small ads - the BEST for those elusive spares - essential services and suppliers, and the BEST events diary around. And don't forget your FREE readers classic-fied! Plus, exclusively for subscribers, a yearly Events Diary & Almanac. It's the ideal gift too; we'll even send a FREE greetings message with gift orders. Remember - CMM is only available by subscription and is not available from newstands; join the 1000s of enthusiasts around the world who have it delivered every month. Order it today by going to our Secure Server Form here, and we'll mail the current issue to you TODAY! Or you can call CMM on 01204 657212 (24 hours), or fax your name, address and credit/debit card details to us on 01204 652764 at anytime. And now - we also accept PayPal, making your order even easier! *FREE ADS NON-TRADE ONLY - must be taken at the time of your subscription. Ad placed on our website & in the first available issue of CMM when you subscribe using our online Secure Server Form. Classic-fied ads are normally charged at £4 each per 35 words, plus £1 each for our live web page. *Year 2019 Almanac & Diary of Events free to all subscribers on our list as of Jan. 23, 2019 - after that date, get yours from only £1.75 extra! Subscribe using the form on our secure server - lock away your details from prying eyes and join our mailing list the safe way today. Secure Ordering Online with CMM! Use our Secure Form to join our mailing list today. **Almanac 2019, worth £9.95; get yours when you subscribe. Hurry! The 2019 edition will be mailed with our February 2019 issue, to all our full paid up subscribers. Click here for details of how get a copy of the 2018 edition with your subscripton! Classic Motor Monthly also makes the IDEAL gift! Don't want to use the online form? Call us on (01204) 657212 or mail your details to us. Payment in sterling only please, by cheque/P.O./Eurocheque - made out to CMM Publications Ltd. - or major credit card. Fax or post your credit card details, and a return mailing address, to us (details at the bottom of the page) - plus, if you wish, your free Classic-fied(s) - we'll place you on our mailing list right away.